Make Lawn Care Easy. Cut Does it Right. Our clients enjoy the best lawn care services in Middle Tennessee. We do not 100% exclusively service these areas; we will travel a small amount outside Nashville. This only applies to lawn mowing. For tree and stump services we travel further on a regular basis. Keep your mind at ease by not having to make any sort of commitment to a yard and grass service. Don’t take your chances by getting locked into a lawn care company that you don't see eye and eye with. Don't worry about triple checking a contract and being tricked into unfair rate changes and other unexpected additional costs. The common practice of using these unethical tactics gives lawn care companies a bad name and makes it hard to give them your trust. It’s almost as if these companies aren't confident enough in their services that they the need to lock you down in order to stay busy. Here at CUT we rely solely on our quality of service to keep you satisfied and to stick with us for years to come! Out of all of the industries the lawn mowing/ lawn care industry is one that seems to be stuck in the stone ages. Many of our customers complain that the only time they still have to actually write a check, address and stamp a letter is the pay the lawn guy. At CUT we are constantly growing and learning the newest common practices of our industry not only in our work but also how we operate our business. We transfer these benefits to you the customer by streamlining how you pay. We are praised time and time again how having just one less thing to remember was a huge burden lifted; we know you're busy and want to make life easier for you! 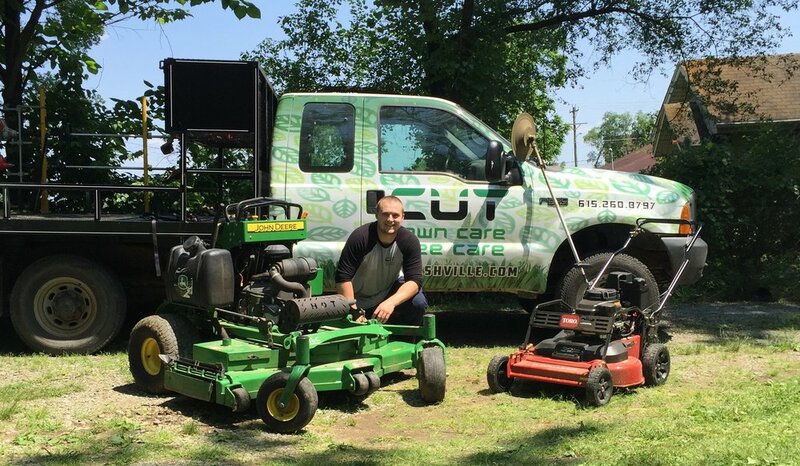 Cut Lawn & Tree Services is a locally-owned and operated business delivering the best lawn care, yard mowing, and lawn maintenance services in the greater Nashville region. We’ll work with you to develop the best lawn care and maintenance program for your yard. Make your neighbors envious with our top-notch lawn care services. We provide a full spectrum of lawn care services in Nashville, TN. We care about our customers and we deliver the very best in customer service. We make life a little easier with paperless billing and we won’t lock you into an inflexible contract. At Cut, we work with integrity and pride so you can enjoy the best service at the best possible price.